Titanium Nitride coating reduces friction and last longer, cutting edge stays sharper longer. Split point eliminates the need for a center punch and keeps the drill from skating. All sizes 3/16" and larger have three flats on the shank for a better grip on chuck. Titanium Nitride coating reduces friction and last longer, cutting edge stays sharper longer. Used in repetitive metal drilling with portable drills or stationary drill press. Jobber length. Titanium Nitride coating reduces friction and last longer, cutting edge stays sharper longer. Split point eliminates the need for a center punch and keeps the drill from skating. All sizes 3/16" and larger have three flats on the shank for a better grip on chuck. Titanium Nitride coating reduces friction and last longer, cutting edge stays sharper longer. Split point eliminates the need for a center punch and keeps the drill from skating. All sizes 3/16" and larger have three flats on the shank for a better grip on chuck. Titanium Nitride coating reduces friction and last longer, cutting edge stays sharper longer. Split point eliminates the need for a center punch and keeps the drill from skating. All sizes 3/16" and larger have three flats on the shank for a better grip on chuck. Titanium Nitride coating reduces friction and last longer, cutting edge stays sharper longer. Split point eliminates the need for a center punch and keeps the drill from skating. All sizes 3/16" and larger have three flats on the shank for a better grip on chuck. Titanium Nitride coating reduces friction and last longer, cutting edge stays sharper longer. Split point eliminates the need for a center punch and keeps the drill from skating. All sizes 3/16" and larger have three flats on the shank for a better grip on chuck. Titanium Nitride coating reduces friction and last longer, cutting edge stays sharper longer. Split point eliminates the need for a center punch and keeps the drill from skating. All sizes 3/16" and larger have three flats on the shank for a better grip on chuck. Titanium Nitride coating reduces friction and last longer, cutting edge stays sharper longer. Used in repetitive metal drilling with portable drills or stationary drill press. Jobber length. Titanium Nitride coating reduces friction and last longer, cutting edge stays sharper longer. Used in repetitive metal drilling with portable drills or stationary drill press. Jobber length. Titanium Nitride coating reduces friction and last longer, cutting edge stays sharper longer. Used in repetitive metal drilling with portable drills or stationary drill press. Jobber length. M7 grade steel with extra hard titanium coating and parabolic bit flutes for strength and maximum service in applications such as metal, wood and plastic; split point prevents walking. Titanium Nitride coating reduces friction and last longer, cutting edge stays sharper longer. Split point eliminates the need for a center punch and keeps the drill from skating. All sizes 3/16" and larger have three flats on the shank for a better grip on chuck. M7 grade steel with extra hard titanium coating and parabolic bit flutes for strength and maximum service in applications such as metal, wood and plastic; split point prevents walking. M7 grade steel with extra hard titanium coating and parabolic bit flutes for strength and maximum service in applications such as metal, wood and plastic; split point prevents walking. M7 grade steel with extra hard titanium coating and parabolic bit flutes for strength and maximum service in applications such as metal, wood and plastic; split point prevents walking. Titanium Nitride coating reduces friction and last longer, cutting edge stays sharper longer. Used in repetitive metal drilling with portable drills or stationary drill press. Jobber length. M7 grade steel with extra hard titanium coating and parabolic bit flutes for strength and maximum service in applications such as metal, wood and plastic; split point prevents walking. Bosch Jobber Length Drill Bit, 5/32 in Diameter, 3-1/8 in Overall Length, 3-1/8 in Cutting Depth, Twist Flute, 5/32 in Shank, Flat, Straight Shank, 135 deg Point, Split Point, Titanium Coated, CSA Certified, OSHA Approved, cUL, UL Listed, For General Purpose Drilling Applications M7 grade steel with extra hard titanium coating and parabolic bit flutes for strength and maximum service in applications such as metal, wood and plastic; split point prevents walking. M7 grade steel with extra hard titanium coating and parabolic bit flutes for strength and maximum service in applications such as metal, wood and plastic; split point prevents walking. Replacement bulbs for ML901, ML902 (688.3698), ML903, run time is 5.8 hours. Titanium Nitride coating reduces friction and last longer, cutting edge stays sharper longer. Used in repetitive metal drilling with portable drills or stationary drill press. Jobber length. Titanium Nitride coating reduces friction and last longer, cutting edge stays sharper longer. Used in repetitive metal drilling with portable drills or stationary drill press. Jobber length. 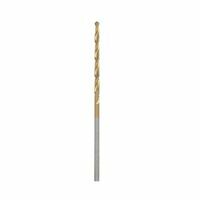 Bosch Jobber Length Drill Bit, 1/4 in Diameter, 4 in Overall Length, Twist Flute, 1/4 in Shank, Flat, Straight Shank, 135 deg Point, Split Point, Titanium Coated, Applicable Materials: Sheet Metal Ducts, Steel, Copper, Brass, Aluminum, Plastic, Plexiglas, Wood, Veneers, Vinyl Siding, Plasterboard, PVC, Stainless Steel and Cast Iron Titanium Nitride coating reduces friction and last longer, cutting edge stays sharper longer. Split point eliminates the need for a center punch and keeps the drill from skating. All sizes 3/16" and larger have three flats on the shank for a better grip on chuck. Titanium Nitride coating reduces friction and last longer, cutting edge stays sharper longer. Split point eliminates the need for a center punch and keeps the drill from skating. All sizes 3/16" and larger have three flats on the shank for a better grip on chuck. M7 grade steel with extra hard titanium coating and parabolic bit flutes for strength and maximum service in applications such as metal, wood and plastic; split point prevents walking. Designed for use with the Makita Cordless Vacuum models BCL180W, XLC02, and LC01 to filter debris. Reusable, easy to clean design. Made of durable cloth for added durability and long life. Includes: (3) cloth vacuum filters. Titanium Nitride coating reduces friction and last longer, cutting edge stays sharper longer. Split point eliminates the need for a center punch and keeps the drill from skating. All sizes 3/16" and larger have three flats on the shank for a better grip on chuck. Titanium Nitride coating reduces friction and last longer, cutting edge stays sharper longer. Split point eliminates the need for a center punch and keeps the drill from skating. All sizes 3/16" and larger have three flats on the shank for a better grip on chuck. Titanium Nitride coating reduces friction and last longer, cutting edge stays sharper longer. Used in repetitive metal drilling with portable drills or stationary drill press. Jobber length. Titanium Nitride coating reduces friction and last longer, cutting edge stays sharper longer. Used in repetitive metal drilling with portable drills or stationary drill press. Jobber length. Titanium Nitride coating reduces friction and last longer, cutting edge stays sharper longer. Split point eliminates the need for a center punch and keeps the drill from skating. All sizes 3/16" and larger have three flats on the shank for a better grip on chuck. Xenon bulb supplies 281 lumens. High speed steel bits used in applications such as drilling in brick, cinder block and tile. Includes (1) each: 1/8", 3/16", 1/4", 5/16", 3/8" and space efficient case with pilfer proof tab. Xenon bulb supplies 281 lumens. M7 grade steel with extra hard titanium coating and parabolic bit flutes for strength and maximum service in applications such as metal, wood and plastic; split point prevents walking. Xenon bulb supplies 281 lumens. Carbide tip penetrates surfaces faster while the flute removes material faster; used in applications such as drilling anchor holes when installing flag poles, mail boxes and running electrical conduit. Includes (1) one each: 3/16" x 4", 1/4"x4", 5/16"x4", 3/8"x4", 1/2"x4" and multi-purpose storage case. Titanium Nitride coating reduces friction and last longer, cutting edge stays sharper longer. Used in repetitive metal drilling with portable drills or stationary drill press. Jobber length. Fluorescent bulb provides bright area light. 4 prong bulb base provides support to bulb for durability. Replacement bulb for 18-volt fluorescent area light, 4-volt cordless area light and DC527 (529.1596) 18-volt cordless area light. M7 grade steel with extra hard titanium coating and parabolic bit flutes for strength and maximum service in applications such as metal, wood and plastic; split point prevents walking. Titanium nitride coating and reinforced web for longer life added strength and durability. Turbomaxtip for burr-free holes; exact centering with walking on straight and curved surfaces; three flatted shank on 3/16" and above for better chuck grip. Carbide tipped bits used in masonry applications, 1/2" diameter. Includes: 3/16", 1/4", 5/16", 3/8", 1/2" and plastic case. Titanium Nitride coating reduces friction and last longer, cutting edge stays sharper longer. Used in repetitive metal drilling with portable drills or stationary drill press. Jobber length. High speed steel drill bits used in masonry applications. Includes (1) one each: 3 /16", 1/4", 5 /16", 3/ 8", 1/2", and molded plastic case. M7 grade steel with extra hard titanium coating and parabolic bit flutes for strength and maximum service in applications such as metal, wood and plastic; split point prevents walking. Bosch Jobber Drill Bit, 1/2 in Diameter, 6 in Overall Length, Twist Flute, 3/8 in Shank, Straight Shank, 135 deg Point, Split Point, Titanium Coated, Applicable Materials: Sheet Metal Ducts, Steel, Copper, Brass, Aluminum, Plastic, Plexiglas, Wood, Veneers, Vinyl Siding, Plasterboard, PVC, Stainless Steel and Cast Iron Tool only. 4-position head pivots for greater versatility. Compact design at only 11-1/8" long and weighs over 2 lb. Soft grip handle provides increased comfort. Includes shoulder strap, two Xenon bulbs. Up to 4 hours run time. Uses 18V LXT lithium-ion. Tool only. Built-in telescoping and 360 degree rotating hook allows unit to hang, over molded lens cover provides increased durability, 13 Watt fluorescent bulb provides bright area lighting, twist and lock tool free lens cover, pre-heat circuit helps eliminate blackening at the base of the bulb, 3.5 hours of run time. Battery sold separately. Drill has variable speed reverse for drilling and driving control, keyless chuck makes bit changing quick and simple, 24 position clutch prevents screws from stripping, 0-750 RPM, soft grips for comfort, slide pack battery provides easy installation and removal of the battery. Stud sensor detects studs through walls up to 3/4" thick. Includes cordless drill with stud sensor, (1) battery pack, (1) DC plug charger and storage bag. Red Lithium battery delivers more work per charge and more work over pack life. Sealed aluminum head designed for impact and weather resistant durability. 135 degree rotating head provides flexible, focused illumination at the desired work area, while its integrated hook leaves both hands free for work anywhere on the jobsite. 8.5" length. Provides the brightest work light (420 lumens) in its class, with 3 dynamic, innovative LEDs. The GLI18V-420 provides a dial to adjust the light diffusion. Users are able to shine a high intensity spotlight on a specific area where they need it. Or they can turn the dial for a diffuse flood light to brighten a larger area. Its swiveling stand and a hard rubber mounting strap provides countless ways of positioning and directing the light, to illuminate any hard to reach work area. It boasts an extreme run time and depending on the battery capacity, it can run of up to 13.5 hours on a 6.0 Ah 18 volt battery (Battery Not Included). The unit is extremely robust, due to its tough housing and aluminum heat sink. Includes (1) 18 volt LED work Light and (1) belt pouch. Battery and Charger Sold Separately. The 18V LXT Lithium-Ion Cordless LED Lantern/Flashlight (model DML806) is a 2-in-1 work light providing ultra-bright illumination, versatility, and convenience. There are three LED lighting modes: 360-degree lantern, 180 degree lantern, and flashlight mode. These versatile settings allow the user to select between lighting the entire work area or a specific task or work surface. The fast-charging 18V LXT Lithium-Ion 5.0Ah battery (sold separately) delivers 11 hours of continuous illumination on a single charge in the 360-degree lantern mode, up to 21 hours in the 180-degree lantern mode, and up to 59 hours in flashlight mode. It is fully compatible with Makita 18V Lithium-Ion batteries. Battery and charger sold separately. Bright LED output of 130 Lumens, head rotates 360 degrees and pivots, powerful magnet for hands free use in multiple placements, kick stand for hands free use in multiple placements, 4 hours of run time. Battery not included. Bright LED output - 160 Lumens. Kick stand, belt hook, hanging and hands free use in multiple placements. Powerful magnet for hands free use. Head rotates 360 degrees and pivots. Run-time of up to 27 hours when fully charged. Tool weighs only 1.5 lbs. Includes: vacuum, crevice tool, extension wand, filter assembly, utility nozzle. Deliver 33DFM for use on wide range of materials. Up to 29 minutes on a single charge using Red lithium XC4.0 batteries, reusable 42 pleat filter, lock-on switch reduces user fatigue. 18.5" L., 2.25 lbs. Flashlight features bright LED output, 11 hours run-time and head rotates 120-degrees. Integral hook for hands free use in multiple placements. 110 lumens. Battery not included. Wide angle beam maximizes light over a specific work area, flexible neck allows for hands-free operation and light to be projected in any direction, lockable head clip offers, extra bright Xenon bulb maximizes brightness of the beam, 3 hours of run time. Battery sold separately. 3 bright LEDs illuminate dark jobsite work areas. 2 brightness settings 500 and 250 Lumens provides flexibility for maximum light output or extended run time. 140 degree pivoting head provides versatility for lighting work surfaces. Built-in telescoping and 360 degree rotating hook allows unit to hang from 2" materials and multiple locations. Over molded lens cover provides increased durability and a non-marring surface for the jobsite. Run-time 3 - 17 hours. Battery and charger not included. Up to 700 yard beam distance. 3 light output modes for distance, clarity and safety. High Mode: 750 lumens for up to 4 hours with M12 XC 4.0 pack. Low Mode: 400 lumens for up to 8 hours with M12 XC 4.0 pack. Strobe Mode: 800 lumens for up to 8 hours with M12 XC 4.0 pack. Moisture resistant rated for use in all weather conditions. Weighs 1.4 lbs. Dimensions: 6.5"L x 11.97"H High definition lighting technology with over 400 Lumens, the new unit delivers unmatched light output to illuminate large work areas. 180 degree - 360 degree adjustable beam allows the user to select between area and task lighting. 2.1A USB charger for tablets, smart phones and other electronic devices. Rugged design featuring an impact resistant lens, IPx4 rating and can withstand 6' drops. Four light settings: high, medium, low and strobe. Two stainless steel hooks designed to be used as a hook or a handle. Weighs only 1.0 lbs. with a length of 10.6". M12 RedLithium battery (Not Included). Bluetooth connect with portable electronic devices up to 30' away. Premium speaker with integrated Bass Port delivers loud, clear sound at all volumes. Jobsite durability with rugged over-mold and metal speaker grill to withstand drops, water and debris. 2.1Amp USB charger for phones, media players and tablets. 3.5mm Auxiliary in port for wired playback (Cable Not Included). Integrated loop for easy hanging and transport. M12 RedLithium Battery Not Included. Powerful LED produces 800 Lumens of high definition light output and it can cast a beam beyond 375 yards. Sliding head allows users to adjust their beam pattern from a flood to a spot effortlessly and it features three output modes for high, low or strobe use. The body is built from machined 6000 series aluminum with a type II anodized finish and can handle anything it may encounter through years of professional use. On high mode; 800 Lumens for 5 hours of run time. Low mode; 325 Lumens for 7 hours of run time. Weighs 1.2 lbs. Dimensions: 9"L x 2.50"W x 2.50"H. Gives users the ultimate flood light for on the go use. Adapts, performs and survives any work environment users come across. Compact size and integrated hanging features like its strong magnets, spring loaded clamp, key hole hanger and wire hanger. Capable of lighting up a large workspace for extended periods of time as it provides 1,000 lumens of high definition light output in it high mode, 400 lumens in medium and 200 lumens of output in low mode. It uses high quality LED with a neutral white color and a high color rendering index paired with a Milwaukee designed reflector to produce an even beam pattern. Impact and chemical resistant lens is able to withstand the toughest of jobsite conditions. LEDs never need to be replaced. Weighs 2.19 lbs. Dimensions: 7.5"L x 5.75"W x 5.5"H.
Adjustable beam 180-360 degrees, 2.1 USB charger, impact resistant lens., four light settings, two stainless steel hooks. Uses M18 Redlithium battery. 11.5l., 1.2 LBS., 700 lumens. 3-Speed electronic switch and variable speed trigger allow for versatile clearing power, lock-on switch reduces user fatigue, extension nozzle clears dust and debris easily from the ground or overhead without having to lean over or stretch, universal inflator/deflator for easy set-up and take-down of most inflatable products, shock-absorbing polymer and reinforced handle resists drops, nozzle made from soft plastic to resist crushing or cracking. 2.6 lb., 6-1/2" H, 100 CFM max air flow. BATTERY NOT INCLUDED. Works with all Milwaukee M18 Batteries (batteries sold separately). Designed to illuminate large work spaces on the jobsite, the cordless flood light uses 8 high-quality LEDs to provide 1,100 lumens and up to 1,300 lux. It's powered by the M18 Redlithium battery for up to 8 hours of run time on a single charge. With its roll cage design and impact-resistant, replaceable lens, it stands up to the toughest working conditions. This compact floodlight features an octagonal shape so the light may be used at multiple angles. The versatile hanger provides hands-free use in a variety of applications. Weighs 3.4 lbs. Dimensions: 8-3/4"L x 6-1/4" W x 6-1/4"H. Tool only, batteries not included. 3 bright LEDs illuminates dark jobsite work areas. 1000 and 90 Lumens. 1 bright red LED to preserve night vision. 2 brightness settings provides flexibility for maximum light output or extended runtime. 90 degree pivoting head provides versatility for lighting work surfaces. Can be seen up to 508 yards or 1,525 feet. Pivoting head allows for hands free operation and light to be projected in multiple directions while standing on its base. Belt hook to provide increased versatility for transportation and a hands free use in multiple placements. Integral hook for hands free use in multiple placements. Over-molded lens cover provides increased durability and a non-marring surface for the jobsite. Light, weighs only 1.42 lbs. Batteries and charger not included. AC/DC powered and Auxiliary ports. Runs off Dewalt 12v/20v Max battery packs. Bluetooth 4.0 with up to 100 ft. range. Compact size for portability and storage. Rubber over mold and feet. The 18V LXT Lithium-Ion Cordless/Corded LED Floodlight (DML805) offers the convenience of cordless or corded operation, and provides bright and even lighting for large work spaces without the high heat of halogens. At full brightness it provides 750 lumens of light, and 450 lumens on low mode. The fast-charging 18V LXT Lithium-Ion 4.0Ah battery (sold separately) delivers 10.5 hours of continuous illumination on a single charge. It also features Extreme Protection Technology (XPT) for improved dust and water resistance. It is fully compatible with Makita 18V Lithium-Ion batteries. Battery and charger sold separately. Spot farther, flood brighter. 198? of rotation. 4 output modes: spot/flood, spot, flood or strobe. High definition; 1,250 Lumens with 700 yards of beam distance. Dust and water resistant. Impact resistant. Low battery indicator (Battery Not Included) alerts users when the battery is nearing end of charge. Weighs 3.1 lbs. Dimensions: 12.9"L x 5.5"W x 4.7"H. Equipped with Bluetooth to wirelessly connect mobile devices. Up to 32 hours of continuous operation in auxiliary mode and 31 hours with Bluetooth function enabled. Features one auxiliary port for MP3 compatibility and one USB port for charging mobile devices. Delivers rich sound; woofer for low sounds and tweeter for high sounds. Control panel for easy operation of connected mobile devices. Protective bumpers are engineered for increased durability. Water and dust resistant construction is engineered for improved operation in harsh job site conditions. Compatible with Makita 12V max CXT and 18V LXT batteries (not included). Includes: Vacuum, crevice tool, filter assembly, and wide utility nozzle. Working on all Milwaukee 18V slide-on batteries, RED LITHIUM or NiCd, the 0880-20 wet/dry vacuum offers long continuous run time and high air power and suction to provide quick and easy removal of dust, debris and water. A washable, reusable wet/dry HEPA filter delivers excellent fine dust collection and does not need to be changed. 9.4 lb., 11-1/2" H, Max Air Flow 45 CuFt Min. LEDs illuminate without the high heat of Halogens. Multi-port battery interface is compatible with 18 volt and 20 volt max batteries. Adjustable light head allows the light to be directed where it is needed. Ideal for portability and use in small spaces. Tool weighs only 3.27 lbs. Batteries Not Included. Two high performance speakers provide loud sound and clear reception. Enhances sound quality with equalizer feature. Radio features AM/FM/AUX and 12 presets to save favorite stations. Bluetooth compatibility allows users to wirelessly stream music from any smart device. Durable and compact radio withstands jobsite elements and is easy to transport. Operates on any 20 volt max Lithium Ion battery. Also, an AC wall adaptor is included to provide an alternate source. Weighs only 3.2 lbs. Battery And Charger Sold Separately. Features digital signal processor, weatherproof aluminum speakers, weather sealed MP3 compartment, shock absorbing ABS polymer housing, and ultraslim size. Powered by M12 Red Lithium battery packs (sold separately) or AC adaptor. Specs: 12 V, AM/FM/AUX modes, digital display, custom EQ, backlit LCD, clock, 10 presets and weighs 3.5 lbs. Includes Auxiliary input cord, AC adaptor and 2 AAA batteries. Drill/driver features 310 in-lbs of torque, two speed gear box for increased versatility, LED work light, 11 position clutch is lightweight for easier use. Impact driver features high performance transmission (torque 1375). Compact and lightweight for ease of use and Quick Release 1/4" hex chuck. Includes (1) LDX220 drill/driver, (1) BDC1202 Impact driver, (1) 20 volt max battery, (1) charger, (2) screwdriver bits and (1) soft bag. Exclusive AM/FM tuner with digital processor, premium speakers and 40 Watt amplifier, weather sealed auxiliary compartment to run MP3/IPODS etc., shock absorbing ABS polymer and steel construction, customizable equalizer and 10-station preset, built-in bottle opener, durable cord wrap stores the 6 ft. AC cord. Powered by A/C power or M18 batteries (not included). Specs: 120V/AC, amplifier 40 Watts, 4" speakers high performance poly, digital display, customizable bass and treble equalizer, digital reception with signal processor tuner, auxiliary input 1/8" stereo jack, dimensions 19.5"x9.5"x11", weighs 17.5 lbs. Compact, lightweight and powerful. Powered by lithium-ion; more power and double the run time of ni-cad. Batteries hold a charge for up to 18 months in storage. Includes drill, impact driver, (2) 20 volt batteries, charger, storage bag and (1) #2 Phillips bit. DRILL/DRIVER; high performance motor produces up to 350 in-lbs of torque. Variable speed trigger switch. 3/8" (10mm) single sleeve keyless chuck. 22 torque/clutch settings. Two variable speed ranges for versatility (0-350/0-1300 RPM). Built in LED work light. On-board battery power indicator. Electric brake. IMPACT DRIVER; 1/4" hex quick change locking collet. Variable speed switch (0-2200 rpm). Rubberized non-slip pistol grip. Cast aluminum gear housing. Incredible 1062 in-lbs of torque. Built-in LED work light. On-board battery power indicator. Electric brake. Can be powered by 18v NiCad/Li-ion, 12v max or 20v max DeWalt power tool batteries. AC/DC power allowing the flexibility to be powered by AC power cord or DeWalt power batteries. Devices storage box protects digital audio devices from jobsite debris and damage. USB power port allows device to be charged via USB when radio is plugged into AC wall outlet. 3.5mm aux. input allows for connection to CD, MP3, portable satellite receivers and other digital audio devices (aux cable included). Heavy duty design with roll cage increases durability to withstand jobsite conditions. Radio Only (Charger Sold Separately). Features a 20 percent brighter flood light. Three light output modes for optimal brightness and run time. High Mode: 3,000 lumens for up to 12 hours with M18 XC 5.0 pack. Medium Mode: 1,500 lumens for up to 4 hours with M18 XC 5.0 pack. Low Mode: 650 lumens for up to 8 hours with M18 XC 50. High definition output with true color, even beam and natural light. Dual power source: M18 or corded. Light head rotates 240? with positive stops. (3) integrated keyholes for hanging horizontally or vertically. Durable roll cage protects light head. Stream any audio wirelessly from any Bluetooth device. Connects up to 100 feet or use auxiliary connection. Loudest volume, lowest distortion. Two high definition mid-woofers maximize clarity at loudest volumes. Two high range tweeters drive high range of treble. Two passive radiators maximize clarity and volume of bass. 40 watt digital amplifier delivers stereo quality sound. Heavy duty construction. Water and dust protection. Impact resistant roll cage. Reinforced side caps and grill enhances impact resistance. Powered by Milwaukee M18/M12 batteries or AC outlet. USB power outlet quickly charges electronic devices in both AC and DC mode. Weighs 5.3 lbs. Dimensions: 7.5"L x 13.75"W x 6.5"H.
3/8" driver-drill with 2 speeds (0-450 and 0-1,700 rpm) delivers up to 210 in. lbs of max torque. Features a compact design at only 7-716" long and weighs only 2.8 lbs with battery for reduced operator fatigue. Impact Driver with variable speed (0-2,600 rpm and 0-2,400 ipm) delivers up to 970 in. lbs of max torque. Features a compact design at only 6-1/8" long and weighs only 2.2 lbs with battery for reduced operator fatigue. Ergonomically designed handles with rubberized soft grips provide increased comfort. 12 volt slide battery design enables tool to stand for convenience. 12 volt compact Lithium -Ion 2.0 Ah battery BL1021B features in integrated L.E.D. battery charge level indicator. Built-in L.E.D. light illuminated the work area. Part of the expanding 12 volt CXT series, combining performance with superior ergonomics in a compact size. Not compatible with 12 volt max pod-style tools, batteries and chargers. The 2 piece combo kit includes: (1) 12 volt max CXT Impact Driver (Tool Only) (DT03Z), (1) 12 volt max CXT 3/8" Driver-Drill (Tool Only) (FD05Z), (1) 12 volt max CXT Lithium-Ion charger (DC10WD), (2) 12 volt max CXT Lithium-Ion 2.0 Ah batteries (BL1021B) and (1) tool case. Equipped with Bluetooth to wirelessly connect your mobile device to play music. Delivers rich sound from two powerful 3.5" side-firing speakers. It is a perfect addition to the workshop or job site. Protective bumpers are engineered for increased durability. One auxiliary port for MP3 compatibility and one USB port for charging your mobile device. Water and dust resistant construction is engineered for improved operation in harsh job site conditions. Runs up to 35 hours with an 18V LXT Lithium-Ion 5.0Ah battery and 14 hours with an 18V Compact Lithium-Ion 2.0Ah battery. Compatible with 7.2V, 12V max, 12V max CXT, 14.4V, and 18V LXT Lithium-Ion batteries. Battery and charger sold separately. The M18 Radius Compact Site Light with Flood Mode offers the user two lights in one for area lighting and tasking lighting. With 2,200 lumens of output in area mode for illuminating large work areas and 1000 lumens of flood lighting for task situations there is no application this light can?t handle. This light offers up to 18 hours of runtime with an M18 XC 5.0 battery and has the option to be plugged in using its AC inlet for extended runtime. Its compact size allows users to take this site light on and off the jobsite effortlessly and its 4-1/4" metal hanging hook allow users to hang this light from above for overhead lighting situations. Equipped with a high impact polycarbonate lens to withstand harsh jobsite abuse. Its high quality LEDs never need to be replaced. 20 volt cordless Lithium-Ion 1/2" drill driver. Two speed gear box between 0-350 and 0-1,500 rpm. Compact and lightweight design. Keyless 1/2" metal ratcheting chuck. Powerful 1,450 in-lbs of torque providing 3,100 BPM. 0-2,800 RPM variable speed to match speed to the application. One handed 1/4" hex chuck for bit changes on the fly. Includes 20 volt cordless Lithium-Ion 1/2" drill driver, 20 volt cordless Lithium-Ion 1/4" Impact driver, (2) 1.3 Ah Li-Ion batteries, Li-Ion standard charger, double ended screwdriver bit, no. 2 Phillips bit tip and kit bag. Compact stature makes these tools ideal for hard to reach jobs. Lithium-Ion charger recharges the batteries. 12 volt drill driver with a 3/8" keyless chuck and 21 clutch plus 1 clutch with 21 torque settings and a drill mode for ultimate precision and control. 12 volt impact driver with 955 in/lbs of torque, up to 2,700 rpm, ideal for driving stubborn bolts and screws. Kit includes: (2) 12 volt Peak Lithium-Ion batteries that deliver steady power for the duration of every charge, (1) 12 volt Peak Lithium-Ion Driver drill, (1) 12 volt Peak Lithium-Ion Impact driver, (1) flashlight, (1) 40 minute quick charger and (1) lightweight padded nylon carrying bag. Drill driver delivers 275 in-lbs of peak torque, 3/8", 0-400/0-1,500 RPM. Impact driver delivers 850 in-lbs of torque, 1/4" hex, and 0-2,000 RPM for fast driving. Kit also includes two M12 Redlithium batteries, 30-minute charger and contractor bag. Up to 15 minutes of continuous use from a single fully charged 18 volt compact Lithium-Ion battery. Re-designed floor nozzle for improved maneuverability and debris collection. Strong suction power for fast and efficient cleaning. Bag-less 2-stage cloth filtration system allows for easier cleaning and quicker debris disposal. Compact and ergonomic design at only 18-3/4" long. Ergonomic soft grip handle provides increased comfort and control. 18 volt compact battery is compatible with 18 volt LXT tools. Provides more run time per charge, reaches full charge in 25 minutes or less and features an integrated L.E.D. battery charge level indicator. Equipped with Star Protection computer controls to protect against overloading, over-discharging and over heating. Rapid Optimum charger communicates with the battery's built-in chip throughout the charging process to optimize battery life by actively controlling current, voltage and temperature. Weighs only 2.7 lbs with battery for reduced operator fatigue. Kit includes: (1) 18 v Compact Lithium-Ion 2.0Ah battery, (1) 18 v Lithium-Ion rapid optimum charger, (1) extension attachment, (1) floor nozzle, (1) filter and (1) cloth vacuum filter. Power and versatility to tackle projects throughout the home and workshop. Compact and lightweight to improve comfort, control and access to tight spaces. Lithium Ion batteries for maximum run time and stay charged up to 18 months. Worx 20 volt lithium batteries fit a wide range of Worx cordless lawn and workshop tools. Includes 20 volt cordless drill/driver and impact drivers, (2) 1.5 Ah Lithium Ion batteries, a 1 hour charger, belt hook and carry bag. Up to 13 minutes of continuous use from a single fully charged 18 volt compact Lithium-Ion battery. Re-designed floor nozzle for improved maneuverability and debris collection. Strong suction power for fast and efficient cleaning. Bag-less 2-stage cloth filtration system allows for easier cleaning and quicker debris disposal. Compact and ergonomic design at only 18-3/4" long. Ergonomic soft grip handle provides increased comfort and control. 18 volt compact battery is compatible with 18 volt LXT tools. Provides more run time per charge, reaches full charge in 25 minutes or less and features an integrated L.E.D. battery charge level indicator. Equipped with Star Protection computer controls to protect against overloading, over-discharging and overheating. Rapid Optimum charger communicates with the battery's built-in chip throughout the charging process to optimize battery life by actively controlling current, voltage and temperature. Weighs only 2.7 lbs with battery for reduced operator fatigue. Kit includes: (1) 18 v Vacuum, (1) 18 v Compact Lithium-Ion 2.0Ah battery, (1) 18 v Lithium-Ion rapid optimum charger, (1) extension attachment, (1) floor nozzle, (1) 6" crevice nozzle holder, (1) crevice nozzle, (1) filter, and (1) cloth vacuum filter. Drill/driver features a two-speed transmission that delivers 0-400/0-1,500 RPM, 3/8" keyless chuck, impact driver delivers 950 in/lb of torque and 1/4" hex chuck, three LED lights that provide visibility without shadows in dark work areas, a battery that has been placed at the bottom of the handle that allows the tool to stand up between uses. Includes: 2 tools, (2) 12V max Lithium-Ion battery packs, (1) bit tip, (2) belt hooks, (1) 40 minute charger, (1) contractor bag. 3/8? Drill/Driver features 0-620 max RPM, 115 in-lbs torque and 11 clutch positions; Mouse Sander with 12,000 OPM and 3-position grip control; Circular saw with 5-1/2? cutting capacity and bevel adjustments of 45 and 90 degrees; LED Work light with luminous intensity of 70 and up to 11 hours runtime. Includes: Drill/Driver, Circular Saw, MOUSE Detail Sander, LED Work light, battery, charger, Double Ended Driver Bit, and (3) Sand Paper Sheets. Illuminates workspace in the toughest jobsite conditions. Build for incredible durability in use, storage, or transport. Cutting edge LED technology provides extended runtime and natural white light. Variable brightness settings up to 3,000 lumens let you customize illumination for your work area. Compact design with carry handle provides easy portability and it sets in seconds. Rotating, pivoting head directs light where you need it. 39" H, 9? length L, 39" height, 16 Lbs. weight. Compact 1/2" drill/driver with 425 in-lbs of torque, weighs 4 lbs., 1/4" hex impact driver with 4-pole frameless motor with 1400 In/lbs. of torque. Includes: 2 tools, (2) 18V Red Lithium compact battery packs, (1) 18V charger, (1) carrying case. Auxiliary port allows connection to CD Players, MP3 Players, and portable satellite receivers with an audio cable (cable not included) AM/FM digital tuner with LCD display, built-in clock, 15 station memory presets, high efficiency weather resistant speakers, dual bass ports, pivoting 11" flexible antenna, runs off of 7.2V to 18V Dewalt batteries making it a cordless radio, 3-stage charging system provides maximum run-time, power outlets, one hour charger for 7.2V to 18V Dewalt battery packs (except Univolt). Specs: charge time is one hour or less, weighs 14.25 lbs Drill brushless motor provides extended runtime. Drill brushless motor provides 360 MWO for heavy and fast applications. Drill high performance 2-speed transmission with rpm's of 0-430 and 0-1700 for speed of fastening. Drill compact size of 8" for work in tight areas. Drill lightweight of 3.2 lbs is 14 percent lighter than brushed PCC601. Impact Driver brushless motor provides 50 percent more runtime. Impact Driver provides 1400 in-lbs torque for driving large fasteners. Impact Driver max rpm's of 2700 for speed of fastening. Impact Driver compact (5.8") and lightweight design (2.9 lbs) for ease of use. (2) Pro grade lithium ion batteries for maximum performance included. The brighter, tougher, taller stand light. The LED Tower Light is designed to give professionals an area lighting solution that adapts, performs and survives industrial use unlike any other portable work light. Can be set up in seconds with it max extension 7' high and it collapses down to 40" for easy transport and storage. The light head can be extended from 4-7' to light overhead work or minimize shadows when casting light downward. Capable of filling large areas with light, it provides 2,000 lumens of high definition light output in high mode, 1,300 in medium and 850 in low. Can run for up to 4, 6 or 10 hours with an M18 RedLithium XC 5.0 battery pack. It uses high quality LEDs with a neutral white color and a high rendering index paired with a Milwaukee designed reflector to produce an even beam pattern. Its reinforced legs are impact resistant and its low center of gravity provides a stable base. The light head is protected by an impact resistant lens and bezel and it nests into a protective shroud for secure transport and storage. Its LEDs never need to be replaced. Low battery indicator alerts users when the battery is nearing end of charge. BATTERY NOT INCLUDED. 1/2" driver-drill with 2 speeds (0-600 and 0-1,900 rpm) delivers up to 480 in. lbs of max torque. Features a compact design at only 7-1/4" long and weighs only 3.3 lbs with battery for reduced operator fatigue. Impact driver with variable speed (0-2,900 rpm and 0-3.500 ipm) delivers up to 1,460 in. lbs of max torque. Features a compact design at only 5-3/8" long and weighs only 2.8 lbs with battery for reduced operator fatigue. Ergonomically designed handles with rubberized soft grips provide increased comfort. Built-in L.E.D. light illuminates the work area. 18 volt compact Lithium-Ion battery BL1820B provides more run time per charge and features an integrated L.E.D. battery charge level indicator. The 2.0 Ah battery reaches full charge in 25 minutes or less and is compatible with 18 volt LXT tools. Equipped with Star Protection computer controls to protect against overloading, over-discharging and over-heating. Rapid optimum charger communicates with the battery's built-in chip throughout the charging process to optimize battery life by actively controlling current, voltage and temperature. The charger has a built-in fan to cool the battery which helps produce more lifetime work. Compatible with Makita 18 volt Lithium Ion batteries with a Star symbol. Combo kit includes: (1) 18 volt LXT Cordless 1/2" Driver-Drill (Tool Only) (XFD10Z), (1) 18 volt Compact Impact driver (Tool Only) (XDT11Z), (1) 18 volt Lithium-Ion Rapid Optimum charger (DC18RC), (2) 18 volt Compact Lithium-Ion 2.0 Ah batteries (BL1820B) and (1) tool bag (831274-0). Includes: Radio/Charger, 16" auxiliary input cords. 2- AAA batteries. Digital bluetooth receiver streams audio wirelessly from over 100 ft. away., USB power port, premium speakers and 40- watt amplifier, customizable equalizer and 10-station preset, reinforced roll cage, metal handles, on-board bottle opener. 12"L, 15:H, 12"W., 17Lbs. The jobsite radio/charger/digital media stereo features Bluetooth technology to connect to the user's smart device (with a range of up to 150 ft) and stream internet radio and stored music. This portable, high performance, weather resistant entertainment system delivers 360? enriched stereo sound. Its four way speakers and a subwoofer provide outstanding sound quality in all directions. Durable, with an aluminum/rubber roll cage and a weather resistant design. The portable radio features a powered USB port. Can be powered by Bosch 18V Lithium-Ion batters or plugging into a 120 V outlet. Its built-in battery charger will charge the user's Lithium_ion batteries as well. Also features (4) 120 V power outlets for connecting tools or other devices. Includes (1) 6" male to male Aux cable and (2) AA batteries. Highly durable, portable and stackable solution designed to supply crisp, clear sound through either the radio functionality or wirelessly through any Bluetooth connectivity. 4 full range tweeters, 1 Subwoofer and 1 assisted bass resonator. IP54 rated for water and dust resistance. TouchSystem carrier cart compatible. Can run on a 12 volt max or 20 volt max Dewalt Li-Ion power tool battery or can be plugged into a wall outlet. Charging capability; built-in charger ensures jobsite productivity by charging 12 volt max and 20 volt max Dewalt power tools. Connectivity to Bluetooth, 3.5mm aux. Input, 5V/1A USB charger. Can be stacked to other ToughSystem modules. Designed to be the most versatile Jobsite radio charger. This charger radio is able to run off and charge all DeWalt slide pack battery packs including 12 volt, 20 volt and FlexVolt packs at 3 amps when plugged into an AC outlet. The unit is designed to include woofers, tweeters and air ports to provide clear and rich sound at all volume levels. An oversized device storage box protects devices from worksite conditions and includes an auxiliary and 2.1 amp USB charging port for convenient device charging. 2 AC power outlets on the side of the unit allow you to plug in additional tools or chargers without occupying additional outlets on the wall. Audio Visual Remote Control Protocol (AVRCP) allows you to control your device from the radio interface so you can keep the device in a safe place and skip to the next song or hit replay on the radio interface. Also contains a bottle opener for convenience. 2 amp charger for 12V Max and 20V Max Dewalt battery packs allows for quick and convenient battery charging. Runs of 12V Max and 20V Max DeWalt batteries making it a cordless radio capable of running off rechargeable and reusable battery power. 2 AC power outlets offer more versatility for jobsite power. Auxiliary and USB ports allows for connection to cd, mp3, portable satellite receivers and other digital audio devices. USB port allows device to be charged via USB ports. Class D amplifier, woofers and tweeters provide full range of high and low sound for optimum sound quality. Two speed transmission drill/driver features 20V Max, 1/2" ratcheting chuck, 0-600/0-2,000 no load speed, and 15 clutch settings. Impact driver features 3 LED lights with 20 second delay to provide visibility without shadows, 1/4" hex chuck, 2800 rpm no load speed, 3200 ipm, and 1400 in-lbs max torque. Includes: 2 tools, 20V Max lithium ion 1.5 Ah battery packs, fast charger, (2) belt hooks, bit holder and contractor bag. The kit includes the following: (1) PCC601 1/2" drill driver, (1) PCC641 1/4" impact driver, (1) PCC670 reciprocating tiger saw, (1) PCC700 LED flashlight, (2) PCC680L 20 volt Lithium-Ion batteries, (1) PCC691L charger and (1) kit bag. Brushless motor optimizes battery energy use for up to 50% longer run time. Variable speed (0-1,300/0-3,000 RPM and 0-1,600/0-3,900 IPM) for a wide range of fastening applications. Includes: XFD11ZB, XDT15ZB, (2) 18V Compact LXT Lithium-Ion battery, Rapid Optimum charger, and toolbag. Dewalt brushless motor delivers up to 57 percent more run time over brushed. Compact (7.52" front to back), lightweight Drill/Driver design fits into tight areas. LED light with 20 second trigger delay provides increased visibility in dark or confined spaces. Compact (5.4" front to back), lightweight (2.0 lbs) Impact Driver design fits into tight areas. Ergonomic comfort grip handle provides ideal balance and tool control. Impact driver's one-handed loading 1/4" hex chuck accepts 1" bit tips. Includes: (1) 20 v compact brushless Drill/Driver, (1) 20 v compact brushless 1/4" Impact Driver, (2) 20 v Max Li-Ion battery packs, (1) charger and (1) kit bag. Screwdriver delivers 175 in-lbs of torque, 15 position clutch and 0-500 RPM. Impact delivers best-in-class 850 in-lbs of torque, 1/4 hex and 0-2000 RPM. Hackzall reciprocating saw delivers 0-3000 SPM, and 11" for quick cutting in tight spaces. Work light features a 90-degree rotating head and an integrated magnet for hands-free. Kit also includes two 12V Redlithium battery packs. 30 minute charger, two Hackzall blades and contractor bag. Two speed 1/2" hammer driver/rill (0-400/0-1,500 RPM) with 4-pole motor delivers 450 in/lbs. of max torque and weighs only 4.2 lbs., variable speed impact driver (0-2,300 RPM) provides 1,330 in/lbs. of max torque and weighs only 3.4 lbs. Includes: 2 tools, (2) 18V LXT Lithium-Ion batteries, (1) 30 minute rapid optimum charger, (1) tool case. Hammerdrill features two speed transmission, 0-600/0-2000 max rpm, 34000 max bpm, 15 clutch settings, 1/2" ratcheting chuck and 350UWO. Impact driver features 3 LED lights with 20 second delay to provide visibility without shadows, 1/4" hex chuck, 2800rpm no load speed, 3200ipm, and 1400in-lbs max torque. Includes: 2 tools, (20) 20V Max lithium ion 1.5 Ah battery packs, fast charger, (2) belt hooks, on-board bit holder and a handy zippered bag. Drill/driver delivers 189UWO max power, 2 speed settings, 1,500 max rpm, 15 clutch settings, 3/8" one sleeve chuck, 0-400/0-1,500 rpm no load speed and weighs 2.4 lbs. Pivot reciprocating saw with keyless blade clamp, 0-2,700 spm, 9/16" stroke length, electric brake, adjustable 3-position handle, LED light, and weighs 3.1 lbs. 1/4" Impact driver delivers 950in-lbs/79ft-lbs of max torque, 0-2,450rpm no load speed, 0-3,400ipm, 3 LED lights, belt hook, one-handed loading and weighs 2.3 lbs. LED worklight provides 4 hour run time, 130 lumens output, kick stand, pivoting head rotates 360-degrees and weighs .5 lbs. Includes two 12 Max Li-Ion batteries, fast charger, bit tip, two belt hooks, 4" 6 tpi wood cutting recip blade, 4" 18 tpi metal cutting recip blade and kit bag. The 18V LXT Lithium-Ion Cordless 2-Piece Combo Kit packs two compact cordless tools with efficient brushless motors for a full range of drilling, driving, and fastening applications. 1/2" Hammer Driver-Drill features all-metal gear construction for applications in wood, metal and masonry. Delivers (0-500 & 0-2,000 RPM), (0-7,500 & 0-30,000 BPM) and 530 in.lbs. of max torque for drilling, driving and hammer. Impact Driver delivers 0-3,400 RPM, 0-3,600 IPM and 1,500 in.lbs. max torque. Both tools are equipped with an efficient and compact brushless motor that is engineered for longer run time, increased power and speed, and longer tool life. The 18V LXT 4.0Ah battery has a category-leading charge time of only 40 minutes for less downtime and increased productivity, and includes an on-board LED charge level indicator for increased convenience. Includes (1) 18V Compact Brushless 1/2? Hammer Deriver-Drill (XPH12Z), (1) Brushless Impact Driver (XDT13Z), (2) 18V Lithium-Ion 4.0Ah batteries (BL1840B), (1) 18V charger (DC18RC) and tool case. The M18 2-tool combo kit includes the 1/2" Compact Brushless Hammer Drill Driver (2702-20) and the 1/4" Hex Brushless Impact Driver (2750-20). The M18 Cordless system's technologies and electronics, innovative motor design and superior ergonomics provide the most efficient blend of power, weight and performance in the industry. The M18 1/2" Compact Brushless Hammer Drill/Driver is the most compact 18 volt drill on the market and delivers over 50 percent longer run-time than drills with brushed motors. The M18 1/4" Hex Brushless Impact Driver is the most compact Impact Driver in its class and delivers over 50 percent longer run-time than Impact Drivers with brushed motors. Both tools feature Milwaukee built brushless motors, REDLINK Electronics and REDLITHIUM batteries that provide more efficient power delivery, for few trips to the charger. This kit includes (1) REDLITHIUM XC 4.0 battery for maximum performance and 2x longer run-time, which is compact and light weight, ideal for fastening applications. The kit also includes a carrying case and a multi-voltage charger. Hammer drill/driver with 4-pole frameless motor delivers 525 in-lbs of peak torque, 0-550/0-1,700 rpm, 29,000 bpm, all metal 1/2" single sleeve ratcheting chuck and weighs 3.5 lbs. Compact impact driver with 4-pole frameless motor delivers 1,400 in-lbs of torque, 0-2,200 rpm, 0-3,200 ipm, 1/4" hex quick change chuck and weighs 2.6 lbs. Includes two M18 XC high capacity Red Lithium batteries, 1-hour charger and contractor bag. Brushless motor delivers more run time. XR Li-Ion batteries with fuel gauge provides more capacity. DCD790 20V Max 1/2" drill/driver compact (7.2" front to back), lightweight (3.5 lb) design fits into tight areas. DCF886 20V Max 1/4" impact driver compact (5.6" front to back) design fits into tight areas. Both tools feature LED lights with 20 second trigger release delay providing increased visibility in dark or confined spaces. Hammerdrill features 3-speed all-metal transmission, 0-575/0-1,350/0-2,000 max rpm, 0-9,775/0-22,950/0-34,000 max bpm, 22 clutch settings, 1/2" all metal ratcheting chuck delivers 535UWO. Impact driver features 3 LED lights with 20 second delay to provide visibility without shadows, 1/4" hex chuck, 2800rpm no load speed, 3200ipm, and 1400in-lbs max torque. Includes: 2 tools, (2) 20V Max lithium ion 3.0 Ah battery packs, fast charger, belt hooks, 360-degree side handle and contractor bag. DeWalt brushless motor delivers up to 57 percent run time. XR Li-Ion batteries with fuel gauge provides more capacity over standard pack. DCD795 20V Max 1/2" hammerdrill compact (7.8" front to back), lightweight (3.6 lb) design fits into tight areas. DCF886 20V Max 1/4" impact driver compact (5.6" front to back) design fits into tight areas. Both tools feature LED lights with 20 second trigger release delay providing increased visibility in dark or confined spaces. 20 volt Max 1/2" 3-speed hammer drill and 1/4" 3-speed impact driver. The 1/2" hammer drill is a high performance 0-2,000 rpm, all-metal transmission optimized tool-to-task for fast application speeds and improved run time. The compact size (8.4" front to back length) and lightweight (4.7 lb) design to fit tight areas. For fast drilling in masonry materials (0-38,250 bpm). Includes 3-mode LED providing lighting in dark or confined spaces up to 20 times brighter than the previous model. The 1/4" Impact driver provides 1,825 in-lbs of max torque at fast 0-3,250 rpm speed and 0-3,600 impacts per minute. The impact driver has a compact size (5.3" front-to-back length) and lightweight (3.4 lb) design. The kit includes: (1) DCD996 20V Max XR 1/2" 3-speed hammer drill, (1) DCF887 20V Max XR 1/4" Impact driver, (1) DCB203 20V Max XR 2.0 Ah Lithium Ion battery, (1) DCB606 20V/60V Max Flexvolt 6.0 Ah/2.0 Ah Lithium Ion battery, (1) DCB118 20V/60V Max Fan-Cooled rapid charger, (2) belt hooks, (1) 360 degree side handle and (1) Contractor bag. Features a 20 volt Max 1/2" Hammerdrill 3 speed, high performance (0-2250 rpm), all-metal transmission optimizes tool to task for fast application speeds and improved run time. The Hammerdrill has a compact size (8.4" front-to-back length) and lightweight (4.7 lb) design to fit tight areas and fast drilling in masonry materials. The 20 volt max Hammerdrill includes 3 mode LED, providing lighting in dark or confined spaces up to 20 times brighter than the previous model. Also features a 20 volt Max 1/4" Impact driver with 1825 in-lb of max torque at fast 0-3250 rpm speed and 0-3600 impacts per minute. The Kit includes: Hammerdrill, Impact Driver, 360 degree side handle, kit box (2) 20 volt Max XR high capacity Li-Ion batteries (5Ah), charger and (2) belt hooks. CSA certified; 1-UL listed. 2 tool combo kit includes: (1) M18 Fuel 1/2" hammer drill/driver, (1) M18 Fuel 1/4" hex impact driver, (2) M18 Redlithium XC 4.0 extended capacity battery pack, (1) M18 and M12 multi-voltage charger, (1) belt clip, (1) carrying case and (1) side handle. Brushless motor works harder and lives longer, while reducing noise and cooling more rapidly to deliver years of maintenance free performance. Durable battery pack provides longer life. The 4-tool compact combo kit features a 20 volt max Drill/Driver with two speed transmission and LED lights for working in dark spaces; A 20 volt Max XR brushless 1/4" 3-speed impact driver that is compact for fitting in tight spaces. Three LED lights make it ideal for working in the dark; A 20 volt max XR brushless compact Reciprocating saw that is compact and lightweight to make your jobs easier and the bright Flashlight to illuminate your work area with LED output of 110 lumens. The Kit Includes: (1) 20 volt Max XR Li-Ion brushless compact Drill/Driver (Tool Only), (1) 20 volt Max XR 1/4" 3-speed Impact Driver (Bare Tool Only), (1) 20 volt Max XR brushless Compact Reciprocating Saw (Tool Only), (1) 20 volt Max LED work light, (1) 20 volt Max compact XR Lithium Ion battery pack and a contractor bag to carry your tools. Corded/cordless Bluetooth LED large area light with built-in battery charger. Helps to illuminate work areas with a maximum of 7,000 lumens. With AC/DC capability, the light runs off any Dewalt 20 volt max battery and can also charge Dewalt slide pack batteries with versatility. The light features instant on/off with no warm-up, dimming as low as 500 lumens, right/left head and is stackable with a wheel option for convenient storage. Users can connect multiple large area lights for added illumination or to power a corded tool. Works in conjunction with the expanded Dewalt Tool App allowing it to be controlled from a users Smartphone or tablet. In addition to the convenience of the Tool Connect app, the light can be programmed to turn on or off at scheduled times automatically. Weighs 27 lbs. Hammer Drill/Driver with 1/2" chuck, milwaukee 4-pole frameless motor delivers 525 in-lbs of peak torque, 0-550/0-1,7000 RPM, and 29,000 BPM. One-Handed reciprocating saw features a dual gear anti-vibration system for unmatched comfort and control. 1/4" Hex Impact with the Milwaukee 4-pole frameless motor delivers 1400 in-lbs of torque. Work light provides a fold-away hook for hands free use and 135-degree rotating head to direct light at the work area. Digital Power Management overload protection prevents damage to the tool and battery in abusive situations. Works with M18 XC High Capacity Red Lithium batteries and M18 compact Red Lithium batteries. Includes (2) M18 XC High Capacity Red Lithium batteries, 1-hour charger, general purpose Sawzall blade and contractor bag. Demolition hammer makes an ideal hammer for hard-to-reach applications. Delivers 5.6 ft-lbs of impact energy and a max of 2,800 BPM. Vario-Lock positioning allows for rotating and locking the chisel with precision. The SDS max chuck system provides tool-free bit changes. The demolition hammer has a 360? rotating auxiliary handle for better grip positioning and an ergonomic grip area for better comfort when chiseling in a wide variety of positions. Includes carrying case. Weighs only 12.4 lbs. Hammerdrill features two speed transmission, 0-600/0-2000 max rpm, 34000 max bpm, 15 clutch settings, 1/2" ratcheting chuck and 350UWO. Reciprocating saw with keyless blade clamp allows for quick blade change without touching blade or reciprocating shaft. Impact driver features 3 LED lights with 20 second delay to provide visibility without shadows, 1/4" hex chuck, 2800rpm no load speed, 3200ipm, and 1400in-lbs max torque. Flashlight features bright LED output, 11 hours run-time and head rotates 120-degrees. Includes: 4 tools, (2) 20V Max lithium ion 3.0 Ah battery packs, fast charger, 360-degree side handle, belt hook and contractor bag. Hammerdrill features two speed transmission, 0-600/0-2000 max rpm, 34000 max bpm, 15 clutch settings, 1/2" ratcheting chuck and 350UWO. Reciprocating saw with keyless blade clamp allows for quick blade change without touching blade or reciprocating shaft. Circular saw features 6-1/2" carbide blade that can cut 2x4's at a 45-degree angle in a single pass. Flashlight features bright LED output, 11 hours run-time and head rotates 120-degrees. Includes: 4 tools, (2) 20V Max lithium ion 3.0 Ah battery packs, fast charger, 360-degree side handle, carbide tipped blade and contractor bag. Hammer drill/driver with 1/2" chuck, 4 pole frameless motor, 525 in/lbs of peak torque, 0-550/0-1,700 RPM, and 29,000 BPM, sawzall reciprocating saw with gear protecting clutch and counter balance mechanism, 6-1/2" circular Saw delivers 3,500 RPM with magnesium upper and lower guards for maximum durability, work light provides a fold away hook for hands free use and a 135 degree rotating head to direct light at the work area. Includes: 4 tools, (2) HC high capacity Red Lithium battery packs, (1) one hour charger, (1) general purpose sawzall blade, (1) contractor bag. Hammerdrill features two speed transmission, 0-600/0-2000 max rpm, 34000 max bpm, 15 clutch settings, 1/2" ratcheting chuck and 350UWO. Impact driver features 3 LED lights with 20 second delay to provide visibility without shadows, 1/4" hex chuck, 2800rpm no load speed, 3200ipm, and 1400in-lbs max torque. Circular saw features 6-1/2" carbide blade that can cut 2x4's at a 45-degree angle in a single pass. Includes: 5 tools, (2) 20V Max lithium ion 3.0 Ah battery packs, fast charger, 360-degree side handle, belt hook, carbide tipped blade and contractor bag. 4 piece kit includes: (1) M18 fuel 1/2" hammer drill driver (Bare Tool 2704-20), (1) M18 Fuel SawZall Reciprocating saw (Bare Tool 2720-20), (1) M18 LED work light (2735-20), (1)M18 Fuel 1/4" Hex impact driver (Bare Tool 2753-20), (2) M18 Redlithium XC5.0 extended capacity battery packs (48-11-1850), (1) M18 & (1) M12 Multi-Voltage charger (48-59-1812), (2) belt clips, (2) bit holders, (1) Contractor bag, (1) SawZall blade and (1) side handle. Variable speed dial, SDS max bit system tool-free bit changes with automatic bit locking, constant response circuitry provides soft start, maintains constant speed under load, provides overload protection, service minder light indicates when preventative maintenance is required, lock positioning rotates and locks chisel into 12 different positions, padded rear handle, 360 degree auxiliary handle, double insulated, UL listed, complies to OSHA. Specs: 120V, 4.4-18.4 ft./lbs., 900-1,890 BPM, 12 ft. cord, 22.5" long, weighs 22.5 lbs. Includes: auxiliary handle, carrying case. Ideal cutting solution for metal decking, angle iron, I-beams, cast iron pipe, brick/masonry, stone/concrete blocks, railroad rails, road curbs, and asphalt. Powered by a 61cc engine with a full 4.4 HP for the most demanding concrete cutting applications. Engineered to start easier and vibrate less. Features Stratified Air Scavenging (SAS) that recovers up to 75 percent of unburned fuel to reduce fuel consumption, and a cyclonic air intake that discards larger debris for increased air filter life and less maintenance. Start capacitor with start support function results in significantly less pull start force. Specs: No Load Speed/Max Spindle Speed: 9850/4400 RPM, Wheel Diameter: 14", Cutting Depth: 5-1/8", Weight: 19.6 lbs. Includes: Universal Wrench, Torx Wrench, Screwdriver, and Adapter Ring. This demolition hammer features an in-line design, for ideal weight distribution while chiseling concrete in downward or horizontal applications. Delivers 17 ft-lbs. of impact energy and a max of 1,700 BIM, yet weighs only 22.4 lbs for excellent power to weight ratio. This hammer provides Constant Response circuitry for constant power under load, as well as smooth starts and overload protection. Variable speed dial allows the operator to match the hammering power to application from 900 BIM to 1,700 BIM. For added user comfort, it features Vario-Lock positioning for rotating and locking the chisel with precision, a 360? rotating auxiliary handle and a padded rear handle for extra comfort. The SDS-max chuck system provides tool-free bit changes. Includes carrying case. Gas power cutter engineered to meet the demand for convenience and performance. It delivers with faster starting, more power, and improved fuel economy. The ignition coil with start-support function stores electrical power with each pull for easier start-ups. It?s engineered for reduced flooding with a carburetor that includes improved deco-valve and metering spring for precise fuel regulation at start up. Efficient fuel consumption with an SLR muffler recycles unburned fuel vapor for reduced scavenging-losses and 15 percent improved consumption. 5-Stage filtration system with advanced directional air flow, for better saw performance. Powered by a 81cc 2-stroke engine with a full 5.6 HP for the most demanding concrete cutting applications. Specs: No Load Speed/Max Spindle Speed: 9350/3820 RPM, Wheel Diameter: 16", Cutting Depth: 5-3/4", Dry Weight: 23.3 lbs. Includes: 16" Abrasive Cut-Off wheel, Universal Wrench, Torx Wrench, Carburetor Screwdriver, Adapter Ring, and Water Attachment Kit. Use for a range of professional concrete cutting applications and is ideal for landscapers, road construction crews, railroad crews, rescue crews, general steel contractors, masons, and welders. Pressure compensated carburetor with vented choke plate reduces flooding. Integrated wheel kit retracts when not in use. Fuel primer bulb for easier cold starts. 5-Stage filtration system for better engine durability. Powered by a 75.6cc 4-stroke engine with a full 4.1 HP for the most demanding concrete cutting applications. Specs: No Load Speed/Max Spindle Speed: 9100/4300 RPM, Wheel Diameter: 14", Cutting Depth: 4-13/16", Dry Weight: 28.3 lbs. Includes: Universal Wrench, Torx Wrench, Screwdriver, Adapter Ring, Maintenance Kit, Water Attachment, and Coupling. All metal housing with active vibration control, shock absorbing top handle reduces vibration by up to 40 percent, tool balance with multiple grip positions in angled, horizontal, and vertical applications, large main handle, well positioned lock on switch, 360 degree articulating auxiliary handle, convenient storage and easy transportation, two way tool retainer; accepts standard 1-1/8" (28mm) hex, air tool steel with retaining collar or Bosch internal locking combo steel. Specs: 120V, 1300 BPM, 34 ft./lbs. impact energy, cULus certifications, 30" long, weighs 38.0 lbs. Includes: (1) pointed chisel (400 mm), (1) articulating auxiliary handle, (1) carrying case with wheels, (1) grease tube, (1) cleaning rag.